Adventure Comics #446: Aquaman and the Creeper! Until its first cancellation in 1982, Adventure Comics was the oldest continually running comic book on the stands (back when there were stands…). Its first issue was called New Comics dated December 1935 by someone calling themselves National Allied Publications. It changed its title with issue #12 (January 1937) to New Adventure Comics. The New was removed in November 1938 and remained that way until its cancellation (although during the Spectre’s run in the early 1970s it was called Weird Adventure Comics, as part of the Weird line: Weird Mystery, Weird War, Weird Western, etc. Weird). Some New Adventure Comics are available for viewing at the online library Comic Books Plus. It went from a comic of humorous stories to action/adventure tales during this time – some stories were written and drawn by eventual-Superman creators Joe Shuster and Jerry Seigel. The comic switched back to its adventure roots for the next few issues (Captain Fear debuted) before Black Orchid debuted in #428 (August 1973). With issue #431 (February 1974), the Spectre began his iconic run of stories by Michael Fleisher/Jim Aparo that were more in the supernatural setting than the superhero one. During this run the readers were treated to some fantastic back-up features; including the aforementioned return of Aquaman and a “lost” story of the Seven Soldiers of Victory. Superboy returned home as of issue #453 (October 1977) until the comic reverted to its anthology roots by becoming a Dollar Comic as of issue #459 (October 1978) and featuring, in various issues, Wonder Woman, Green Lantern, Flash, Deadman, Elongated Man and Aquaman. This lasted for seven issues. As a Dollar Comic, Adventure became a bit of a repository to wrap up story arcs from cancelled comics: the New Gods and the Justice Society of America completed their storylines (most notably the JSA tale featured the death of the Earth-2 Batman, a critical moment in the creation of the Huntress). 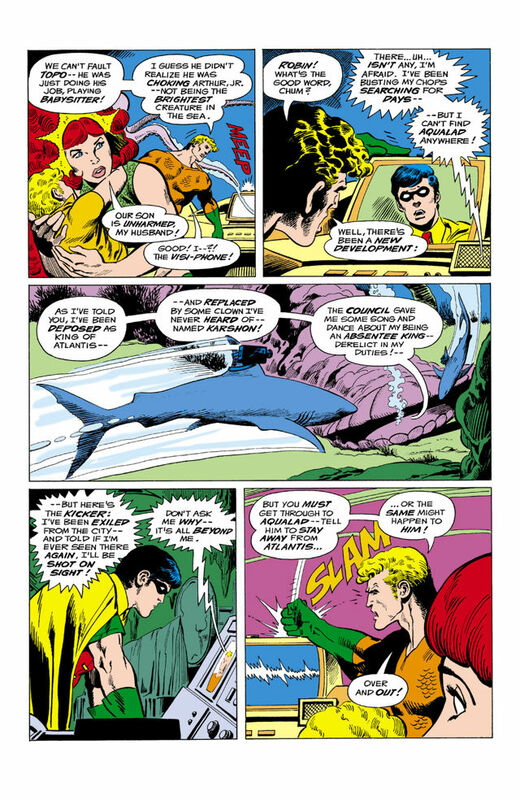 With the new decade Adventure returned to standard size as of issue #457 (January 1980) with a new version of Starman debuting, sharing the bill with Plastic Man (and eventually a three-way bill with the returning Aquaman) through issue #478. 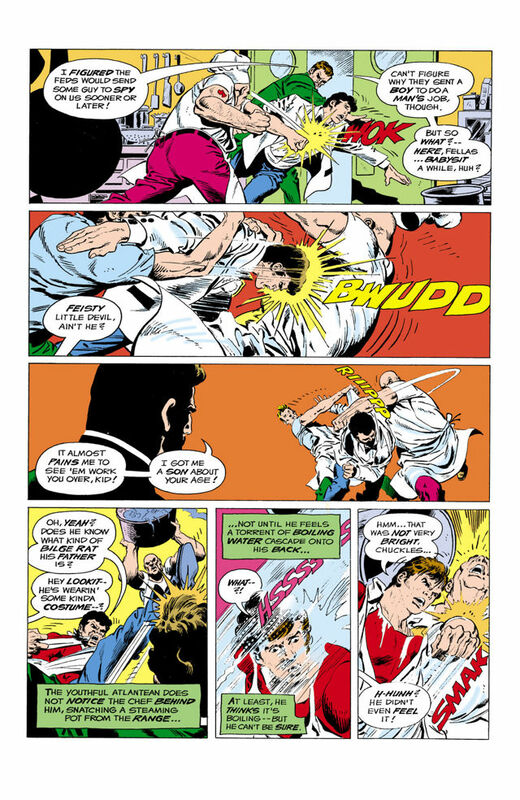 Issue #479 (March 1981) featured a rebooted Dial H for Hero, where two normal people turned into fan-created superheroes, until #490 (February 1982). The title was revived in September 1982 as a digest-sized comic featuring new tales of Shazam and Challengers of the Unknown. It was mainly a reprint series for the Legion of Superheroes. Those reprints eventually took over the book until its final cancellation as of issue 503 (September 1983). Adventure Comics was revived a few more times and in September 2010 was brought back with new numbering through twelve issues, but then resuming the older numbering with #516 (503 + twelve new issues, you see) again as a Legion vehicle until finally put to rest as of issue #529 (October 2011). The splash page shows Topo the octopus strangling Arthur Jr., but the dumb brute was only rescuing the baby – who was crawling to the exit. Robin calls the Sea King to report he has not been able to find Aqualad. 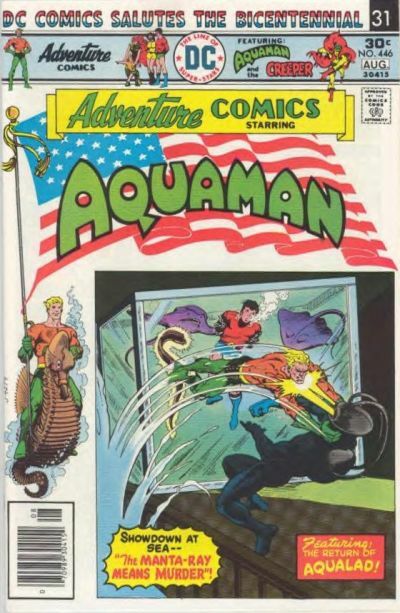 Aquaman tells Robin of recent events – his being deposed and banished from Atlantis – and tells Robin to warn Aqualad when found to avoid the undersea kingdom lest he be shot on sight! Meanwhile, Aqualad and Tula (Aquagirl) are on a gambling boat in Louisiana to stop a diamond-smuggling ring. Aqualad fights off the smugglers but if finally knocked out. He is revived to discover the ringleader is Black Manta! Manta catches Tula eavesdropping and, not knowing who she is, ties her up and throws her into the sea to her supposed death! Interlude: while Aquaman is away, his successor Karshon, plots an assault on Mera and Arthur Jr.
Aquaman finds Tula and unties her. They raid the gambling boat, rescue Aqualad and beat Manta to a pulp. Black Manta ducks out and escapes, even fighting off a giant squid holding his manta-ship. On board, Aquaman discovers a cache of underwater laser rifles – the kind used by his successor Karshon. Manta was not only smuggling diamonds, but running guns to Atlantis! This story was reprinted in the trade paperback Death of a Prince, 2011. 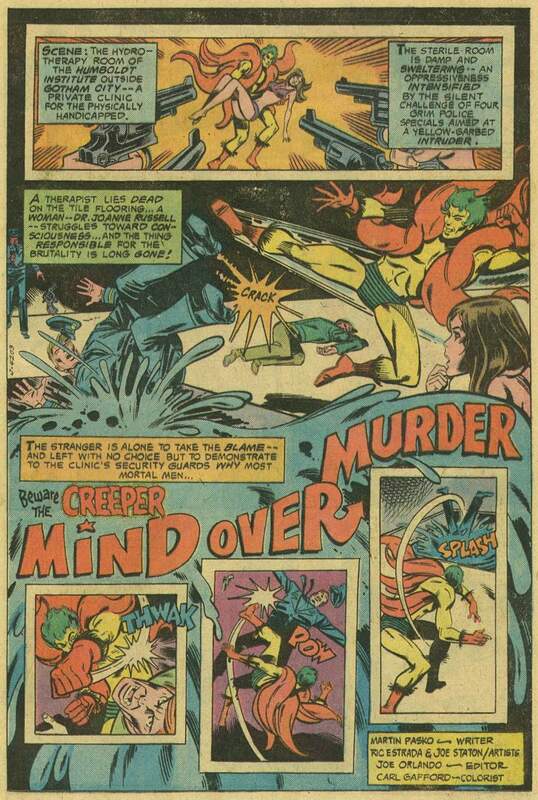 “Mind Over Murder”, Martin Pasko ( w ), Ric Estrada and Joe Staton (a). Part two of three. A solo Creeper tale. He first appeared in 1968 in Showcase #73 and in his own comic for a time. He was a creation of Steve Ditko and the art here is reminiscent of his style. At the Humbolt Institute for the physically handicapped, the Creeper saved Dr. Joanne Russell from a brutal assault from a giant plastic monster that had already killed one therapist. The four policemen charge into the room and train their guns on our hero – thinking him responsible! The Creeper fights off the police. Creeper remembers the plastic killer – he saw it during an interview with Dr. Vernon Maddox in his secret identity as TV reporter Jack Ryder. Maddox could control a mannequin with his telekinetic power. As Ryder visits Russell, a sleeping Maddox subconsciously activates the killer mannequin. Russell tells the Creeper that she and Maddox are rivals competing for the same grant money, but is that reason enough to kill her? While they talk, the mannequin attacks! Russell, on the Creeper’s instructions, calls Maddox and wakes him. Maddoz uses his telekinetic power to force Russell to walk out the window of her high-storied hospital room! To be continued! Dateline Adventure: letters for Adventure Comics #444. All positive letters praising the Aquaman series (and rightly so, it was a great run) by Kevin L. Callahan, Brea, CA, Scott Gibson, Evergreen, CO and Scott R. Taylor, Portland, TX.